A jacket, warm heat from a fire pit, a beverage or two under the beautiful evening sky is a great way to spend a hour or two with guests at the Rifflin'Hitch Lodge in Southern Labrador. The best stories are told by the guests around the fire pit as you breath in the fresh crisp wilderness air of Southern Labrador. 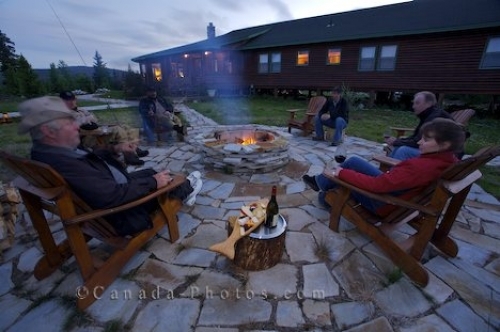 Picture of people enjoying the evening around the outdoor fire pit at the Rifflin Hitch Lodge in Southern Labrador.